ï»¿ HKDEFENSE.US: The Official Home of HECKLER & KOCH DEFENSE INC. Welcome to HKDefense.us, the official website for Heckler & Koch Defense Inc.
HKD is committed to providing the most sophisticated weapons systems on Earth to the military and federal law enforcement customer. HK Defense is in service to the Military and Federal Law Enforcement, and the world class training provided by the HK Defense Training Group supports all military and law enforcement customers. Take some time to explore the HKDefense.us website. You will soon come to know, why in a world of compromise, some don't! Blackwater and HK announce new training partnership. Details here. 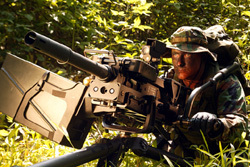 HKD wins multi-year contract for add-on grenade launcher. Details here. HKD wins largest LE contract in history. Details here. 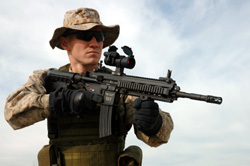 HK416 article in Jane's International Defense Review. Details here. Copyright © 2004-2006 Heckler & Koch Defense Inc. All Rights Reserved.